Insane number of emergency vehicles have gone by my place on Wealthy. Even two State Police cars. And the online police scanner is down! Arrrgh! 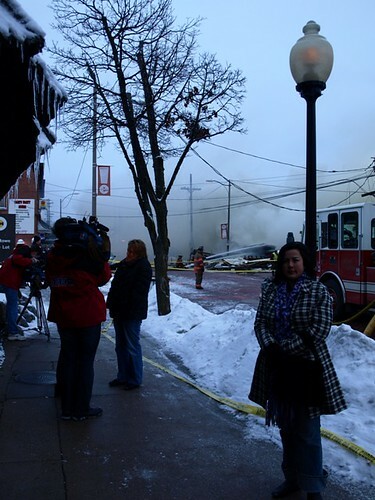 WZZM has a photo up. That place is totally gone! I was looking on maps.live.com also and believe you are right. As least from what I can tell from the pictures posted. 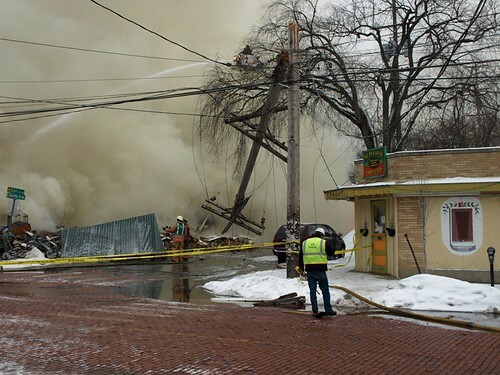 From the WZZM website, it mentioned that someone from DTE was called to the site about 3pm for a possible gas leak. Just drove by...doesn't look good at all. The entire building has collapsed. A lot of teary faces. I pray that everybody survived. That is the building which used to house Socrates Cafe, back in the day (like, ten years ago). This makes me very sad. I hope everyone involved makes it out alive. as the current business in that building. Anyone know with who owns it? Neil Trevisan owns the hair salon on the second floor. It's where I had my hair done for my wedding. Man, I live only a couple blocks away on Lake Dr. I want to leave work early to go check it out. Definitely not good for Eastown. I'd assume it'll be a while before anything is rebuilt. I can see the dirty yellow smoke billowing from my upstairs deck on Hurd. I just got back from the scene. 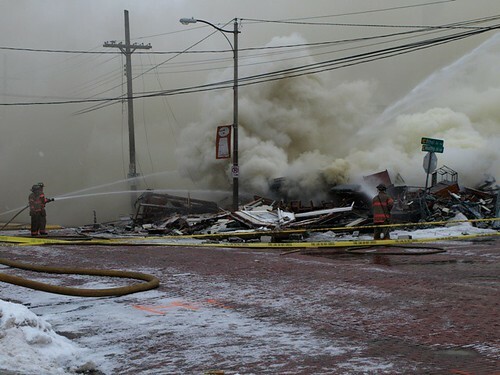 Thankfully everyone got out okay, which is amazing considering the entire building is gone. 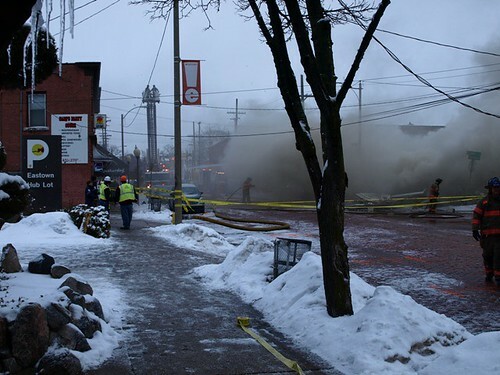 Ralph from Rafav's pulled out four people from the rubble. Wealthy Street in Eastown is a mess, the area will be impacted for days. When its all clear, we all need to do our part and support the businesses affected by this incident. Rally around Eastown! ^ The upside-down exclamation E in the first picture says it all! 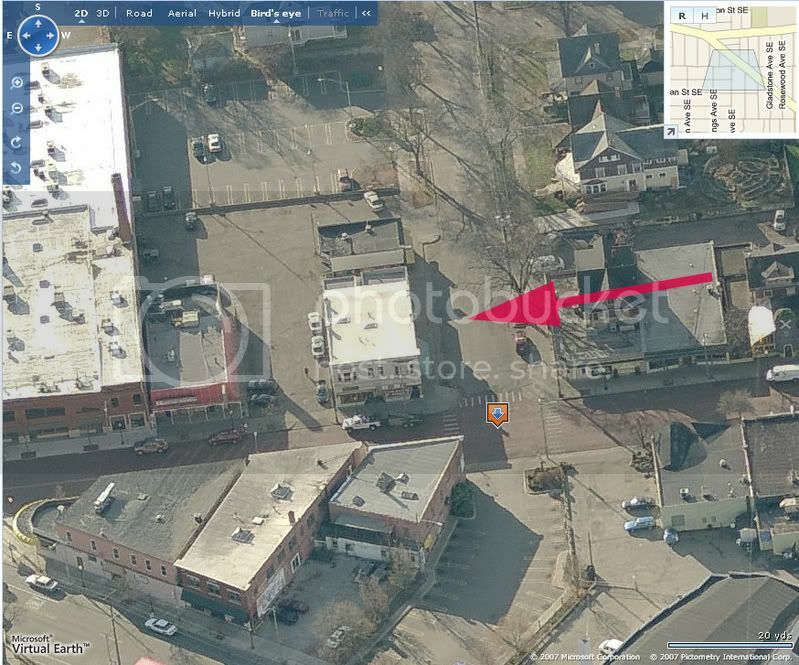 Wow this looks like a very dense area from what I have seen on the news in Detroit and the photos on here. Hope all works out okay for the affected neighborhood. The businesses in this direct area might be closed for days. We'll need to Rally around Eastown! Man, what a bummer. I'm glad to hear everyone's out ok, but sorry to hear of the event. Eastown is a fantastic place and will pull through!